My oldest daughter went to the spring formal " the Royal ball" this last weekend. Usually it is called a prom at most schools but the term prom has negative connotations of drinking and hotel parties ... surprises nine months later. So this school which just happens to be a Christian school calls it the Spring formal instead to try and avoid that. So any way I made her a boutonnière for her date made from beads. I made the flower out of random shades of red and silver beads... The leaves are green random beads as the baby's breath is random white beads. This young man and his family has been a family friend since my oldest was in 3rd grade. So we wanted to make something nice for him that he could keep. So this is what we cam up with. He will be going on his mission soon like 5 weeks (it is a Church of Jesus Christ of Later Day saints thing) please say prayers for a good, strong faith building and safe mission for him. 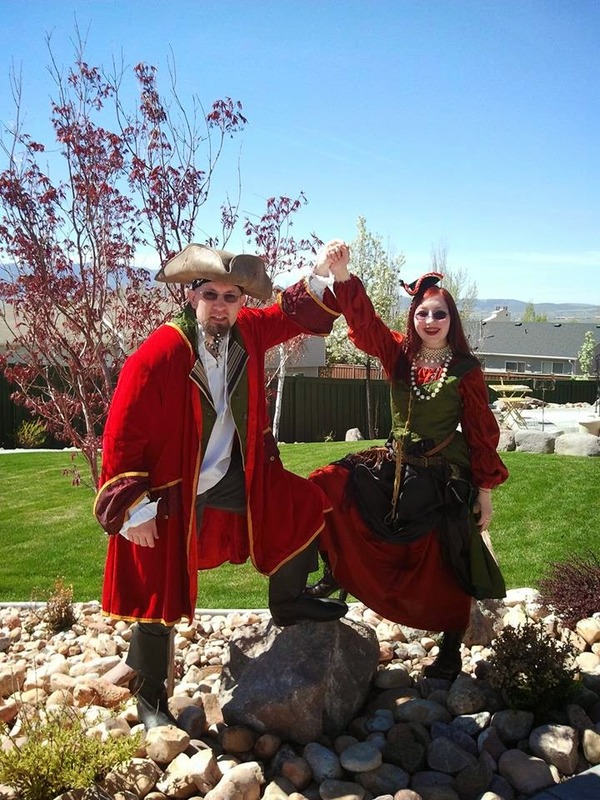 My husband and middle daughter went to fanx-comic-con this last week in this post are a few of the outfits they wore. The first day they both went as Pirates. It was an easy thing to do. The Rust colored tunic you see my daughter wearing is a new piece I made a few days ago for the Shakespeare play this year. She is just breaking it in a few weeks early. 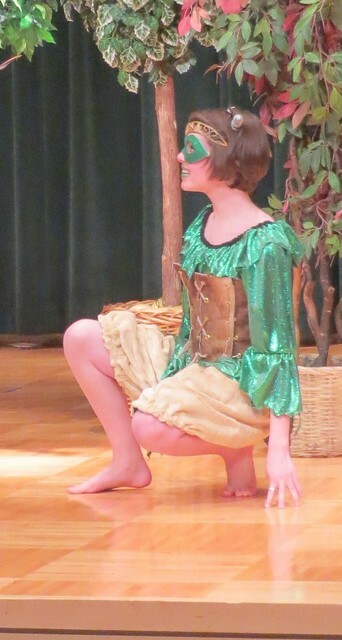 It is a tunic I made for some of the peasant characters to wear in a Mid Summer Night's dream. I have actually made four new tunics, four new skirts, three new shirts , three new aprons, 3 new hats, and 3 new shawls so.... and so on in the last week for this years play. I have made most of these to accommodate the peasants in the play. We wanted new costumes for that group this year. I wanted to use solid colors so they would stand out against the brocade of those who are the nobles and merchant class. I will post more about those costumes later. The black over skirt she is wearing I made three years back for the play "The Merchant of Venice". 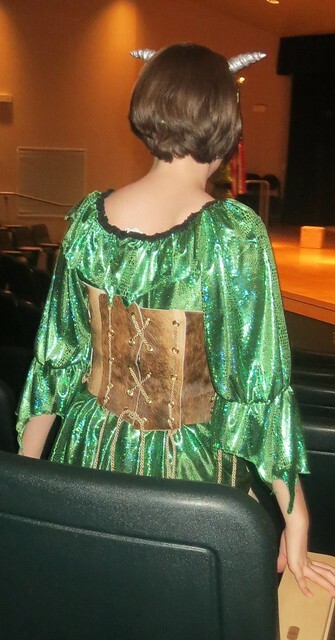 I also made the corset she is wearing four years ago for the play "Much Ado About Nothing". My husband borrowed some costumes pieces hat, head scarf, jacket, boots)from a friend and wore some of ours with his outfit. I made the shirt and vest last year for "Little Woman". I never posted all the shirts I made or the vests. I need to get around to that. 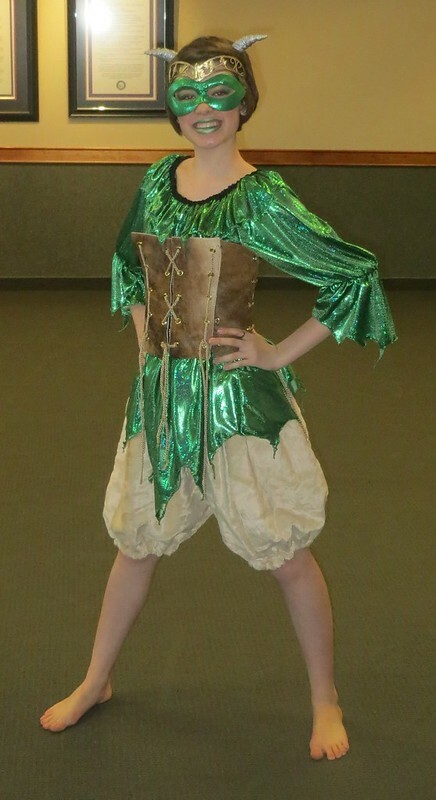 The borrowed items are from a long time family friend who does a ton of costuming for the BYU folk dance team. 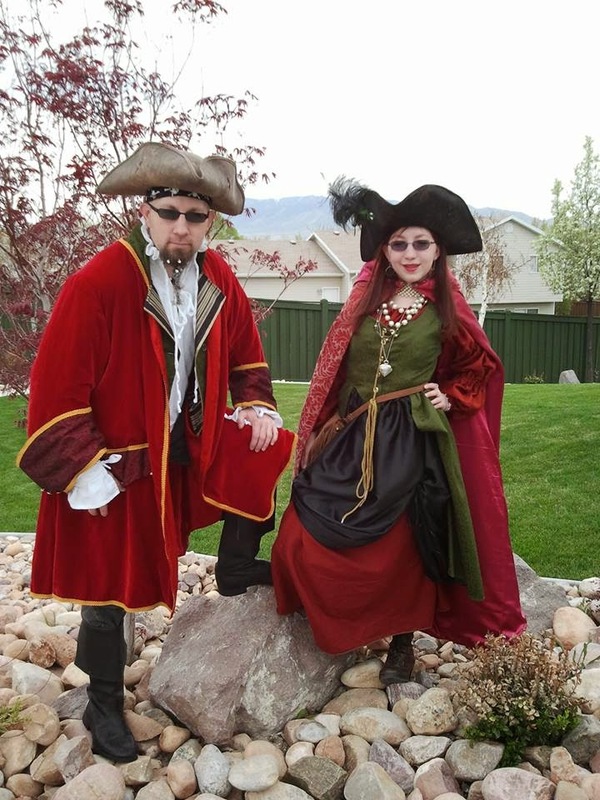 But these are their personal costumes and do not belong to BYU. The glass pearl necklace my daughter is wearing she and I made on the 16th out of three strings of glass pearls that use to belong to my Vavo but were broken and damaged so we re-stung them and made them into one necklace that was a lace choker. My daughter is so happy to get to wear those beads made her day. The first day they took off their costumes real soon after getting there like less than an hour. So they decided to actually wear them on day two my daughter changed hers a little adding a bigger hat and a cape. The cape is one I made for the character "Jo" in "Little Woman". My husband switched to a more pirate like shirt. Day one was sunny day two overcast thus the color changes in the costumes. On the second day of comic con there was to be a costume contest. Sadness my husband and daughter were supposed to be in the costume contest at comic con but they had to turn down the request from the staff members. Because my daughter had to be at a school choir performance that night by 6:30 and the contest would not start until 5 and that was cutting it too close with the long drive home. It would have been fun to see if one of my costumes could have won. Oh well at least I know they were good enough to be asked to participate in it. They said lots of people stopped them to take photos with them and of them glad they had fun my daughter has had such a rough year health wise this was her reward for when she had 2 report cards in a row with straight A's while going in and out of the hospital. They got the tickets back in February so they did not know there would be a conflict with a school choir performance. On the last day my husband continued to be a pirate we have other costumes I think he just liked this one. My daughter went as the dark fairy cobweb. She left her wings at home as she was worried with the crowds on the last day they would be mangled. Now they are home and exhausted from three days of fun. Doing another cross-stitch for a customer. This is the same person that had me do them in the past. She just keeps getting grand babies. I decided to show all the progress in just one post. As most know I am not fond of cutesy items and yes I consider this cutesy. I also discovered during this that it is getting harder for me to do this type of work my eyes are having a hard time focusing on such things so close to me. So I do wear glasses now when my eyes are tired from doing small hand work for long periods of time. I guess age is catching up to me. I have not quiet finished puck I am making this character a white fur cape to go with the costume and she has a leaf sleeve she wears too. Her hair will look rumpled for the play. But it is only partially made at this point in time. So I will take photos when that part is done and on stage. 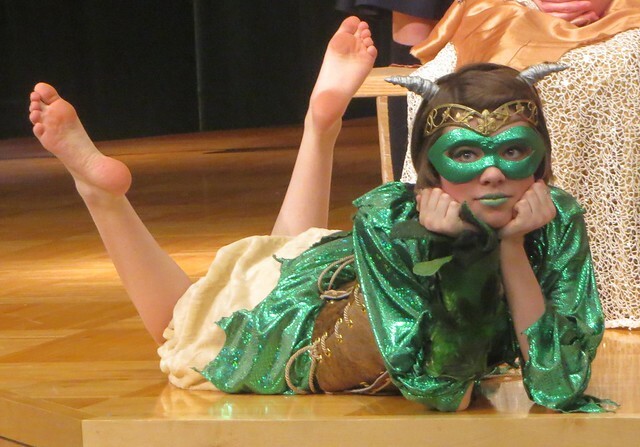 I have assembled the rest of the costume for Puck. 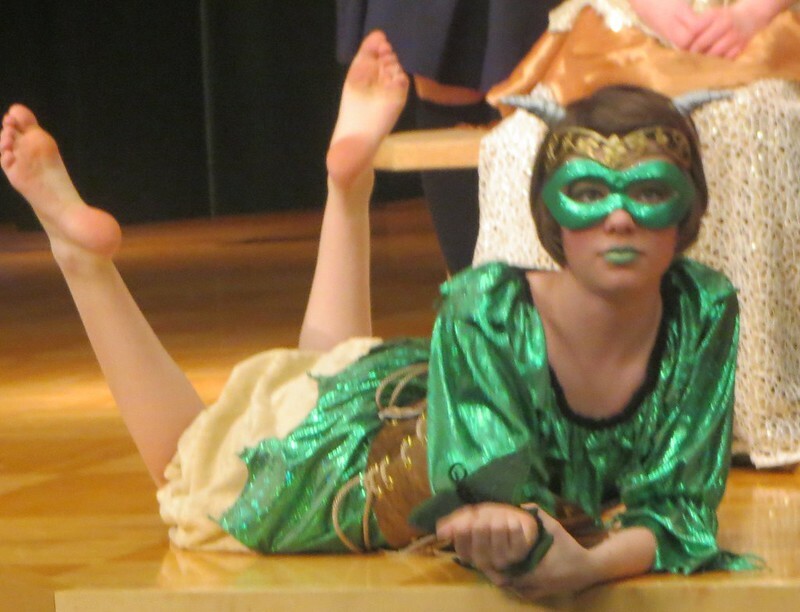 I even was able to get some photos of this costume of the girl that is playing that character. If you follow my blog i wanted all the faerie like people to have something that sparkles on them so when they are on stage they can glitter shimmer and or shine. Hers is more shimmer and shine but her mask does have a glitter effect to it. I like the way the mask horns and crown all worked together real well. It was fun making the cast members lips match their costumes. Originally the director wanted the faces painted for the faerie realm but I really did not want to deal with that much face painting it takes a long time to paint that many faces plus it never look is exactly the same from one day to the next. I like the masks it is fast, easy and looks the same each day. My middle daughter helped Puck put on the sleeve as I was chasing other costume things down. Little did my daughter know she put it on Puck upside down I will correct that for the play. I also may move it to one leg instead of one arm.